Tigerino Canada is a natural clumping litter. Made in Canada from natural clay granules it is highly absorbent and very economical. It rapidly forms into clumps and is up to 4 x more efficient than conventional clumping litter! The granules are especially fine and low in dust. Tigerino Canada Cat Litter is made from 100% pure, natural clay and is free from any kind of chemical additives. It binds odours gently and efficiently and has a gentle baby-powder scent – which makes it a pleasant experience for both you and your pet. 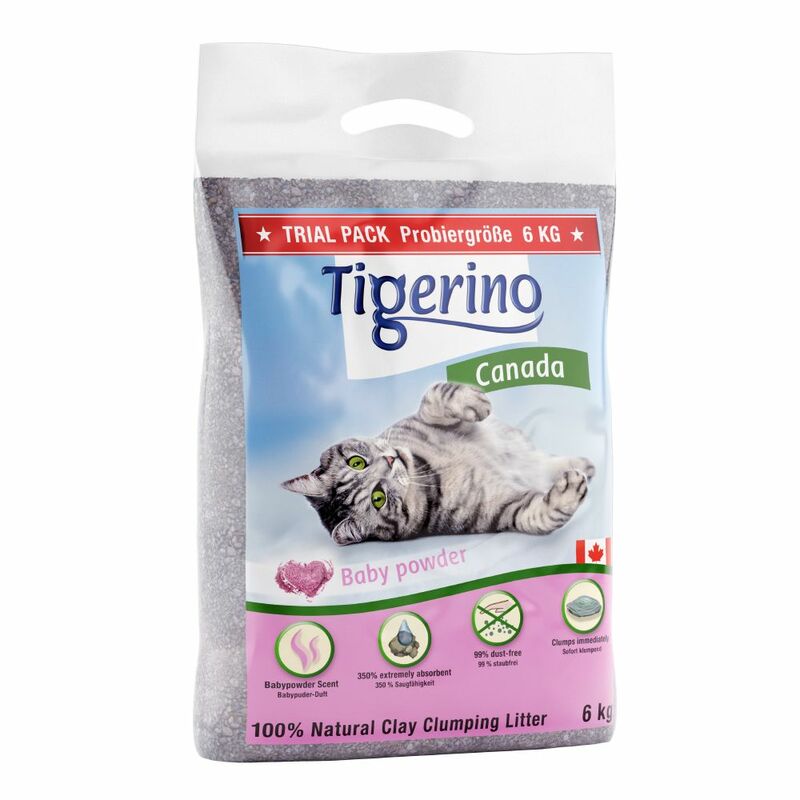 Tigerino Canada Clumping Litter at a glance: High AbsorbencyTigerino natural clay cat litter is known for its great absorbency rates (350%). This makes it particularly economical to use. Rapid ClumpingTigerino clumping litter forms immediately into strong clumps, thanks to the 350% absorbency strength. These formed clumps can then be easily removed. Especially fine, natural clay granules with Highly absorbent, very economical 4 x more efficient than conventional litter, very high absorbency Clumps immediately and very effectively (350% absorbency) 99 % dust-free very low in dust Gentle baby-powder scent from natural oils (no powder) binds odours, long-lasting 100% natural: made with pure, high quality clay - free from any kind of chemical additives The dirty litter forms rapidly into small clumps. This helps to keep the rest of the litter fresh and dry. Regular removal of clumps with a litter scoop will keep it hygienically fresh.